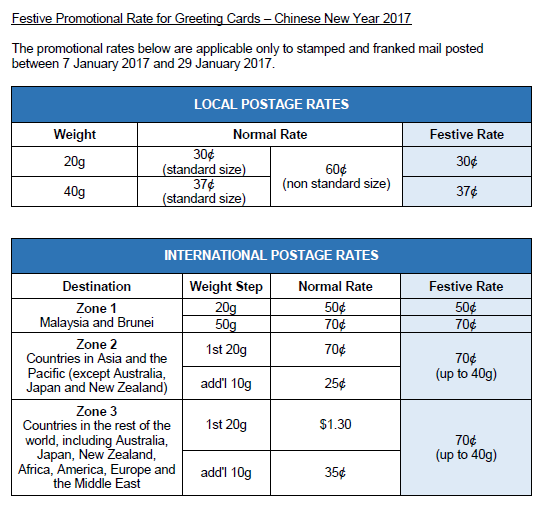 Singapore, 3 January 2017 – Singapore Post Limited (SingPost) is offering festive postage rates for Chinese New Year. The rates will be applicable for stamped and franked greeting cards posted between 7 January 2017 and 29 January 2017. This is the 16th year SingPost is offering promotional postal rates to encourage the sending of greeting cards during Singapore’s four major festivals: Chinese New Year, Hari Raya Puasa, Deepavali and Christmas. This entry was posted on January 4, 2017 at 4:52 pm and is filed under Singapore. You can follow any responses to this entry through the RSS 2.0 feed. You can leave a response, or trackback from your own site.